by ArtsHub, originally published in the Global Newsletter. You can read the original article online here. 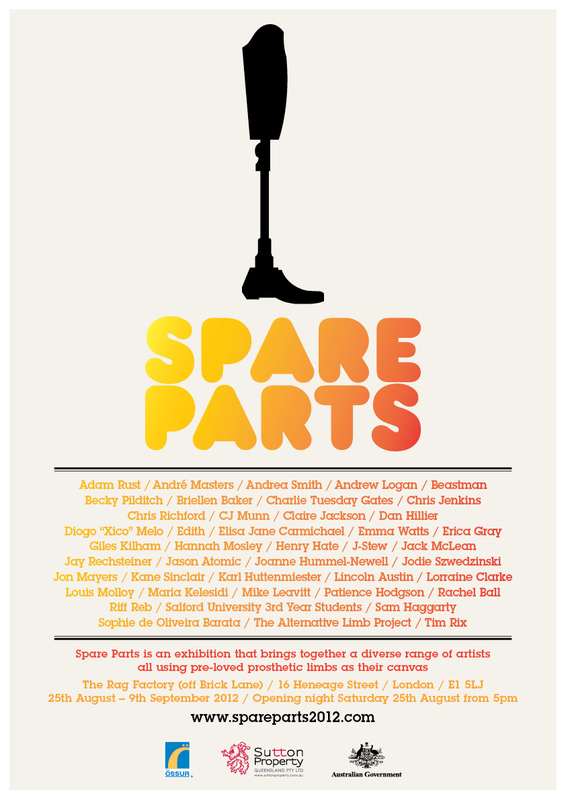 Held during the Paralympic Games, Spare Parts is an exhibition featuring prosthetic limbs that have been transformed into various pieces of art. Curated by Brisbane artist Priscilla Sutton, this exhibition is sure to be a fitting companion to the Paralympic Games, where many competing athletes have prosthetics. The idea for the exhibition came to Sutton when she found her own old prosthetic legs while cleaning out her wardrobe. What followed was a highly successful exhibition held at the Brisbane Powerhouse. The success of this exhibition caused Sutton to set her sights on the global art world in the hopes of sending out a strong message about those who have ever had need of prosthetic body parts. ‘We want to turn prosthetics into a positive conversation and try to take the taboo out of the subject. High-profile people like the athlete Oscar Pistorius and the many servicemen and women who have lost limbs and are enjoying a fulfilling normal and active life are also sending out very strong positive messages,’ she says. New prosthetics for the upcoming London exhibition have been collected, and artists from the UK, France, Australia, America and Japan are all working on transforming the prosthetic parts into works of unique art. ‘While the world looks on and is inspired by elite athletes, this exhibition is about the everyday life of an amputee and celebrating prosthetics. We shouldn’t wait four years to feel comfortable and confident in talking about amazing legs, andSpare Parts is about just that – creating an open and positive conversation,’ Sutton says. Another great source of inspiration came to Sutton in the form of seven-year-old Zoe Larson, who owns a polka dot prosthetic leg and contributed two of her old prosthetics to the exhibition. Like Zoe, Sutton herself has had to live with a prosthetic leg after having elective surgery in 2005 to remove the leg that was affected by a bone condition. Now, Sutton has two prosthetic legs to lean on – one which allows her to run and which is decorated with brightly-coloured Japanese fabric and the other which features artwork by pop surrealist artist Mark Ryden. Above all else, she hopes that the exhibition will raise awareness of disability through the beauty of art. 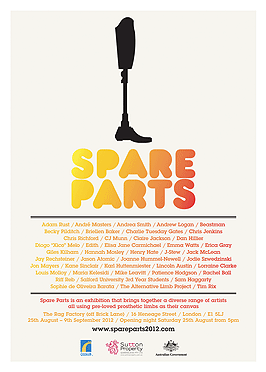 ‘This exhibition is a great opportunity to create an open and positive conversation about prosthetics, amputees, disability and art,’ she says. 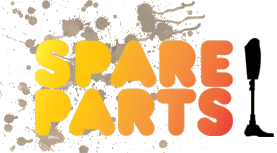 Spare Parts is taking place from 25 August to 9 September at The Rag Factory in London.